When the first issue of Warren Ellis and Gerardo Zaffino’s Karnak series came out, it instantly cemented itself as the most amazing of Marvel’s new Inhuman comics. That was four months ago, and the wait for the second issue has been almost unbearable... but Karnak #2 is so undeniably brilliant that it was worth the wait. 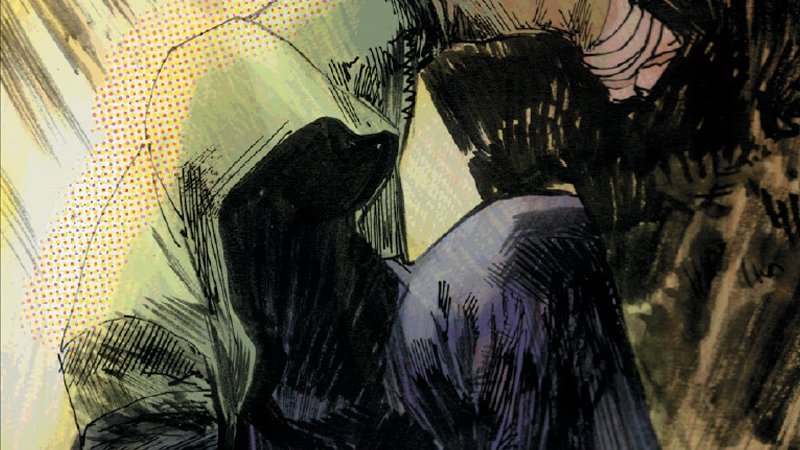 Spoilers ahead for Karnak #2, by Warren Ellis, Gerardo Zaffino, Antonio Fuso, Dan Brown, Clayton Cowles, and Joe Caramagna—and also a warning: some of the pictures below are going to get a little bit brutal. The new Karnak picks up immediately where the first issue left off. If you understandably don’t remember, the that issue saw hypergenius/complete martial arts badass Inhuman magister Karnak on the trail of a kidnapped Inhuman boy at SHIELD’s behest—with Karnak about to go to town on a base full of armed men. Karnak #2 opens with said going to town. A whole nine pages of it. It’s incredible. Aside from an introductory page flashing back to Karnak as a young child in Attilan, the opening half of this issue includes no dialogue as the Inhuman slices his way through opponent after opponent to track his quarry. It’s a technique that Ellis can’t resist. His ongoing James Bond series did something to similar effect recently, and of course, Ellis’ run on Moon Knight had a sequence like it all of it its own. It’s easy to see why Ellis loves it, though; the narrative technique lets Zaffino and Brown’s gorgeous, raw artwork take center stage, in what is pretty much comic book’s answer to The Raid’s infamous hallway fight. Sorry, Daredevil. Karnak got you beat on this one. It is, without a doubt, one of the most brutal and brilliant action sequences in a Marvel comic since... well, since Ellis and Declan Shalvey’s own Moon Knight #5. There’s an amazing sense of flow to the entire sequence, as Karnak’s limbs blur into sweeping lines or hazy strikes that give the whole thing both an incredible sense of speed and a gut-wrenching rawness. Karnak dances through panels, kicking and punching people so hard he’s smacking them almost directly into the structure of the pages themselves. It’s really intense stuff. Karnak’s ability to see the flaw in all things used to make him something of a trickster, a character that could pick apart debates and plans and use that to his advantage. Ellis’ Karnak uses it to turn himself into a living weapon, an unstoppable force that not only sees flaws in the entire world, but exploits them to visceral, gory effect. Karnak is an Inhuman comic like no other in Marvel’s roster. In a period where the company is trying to push the Inhumans as major players, with books like Uncanny Avengers or Uncanny Inhumans which see the Inhumans strive for unity and common ground with the world, to have a series that constantly emphasises Inhumanity’s threat and stark difference to that world is as refreshing as it is satisfying. In a world where his kind hold themselves back to put on a good front, Karnak doesn’t care one jot. Can Marvel Make You Love The Inhumans? In the end, Karnak doesn’t find the Inhuman boy he’s seeking. He’s sent on a quest that will hopefully allow for even more of these glorious fight scenes, a veritable globetrotting, punch-laden adventure. Hopefully, we won’t have to wait another four months to see the rest of it.